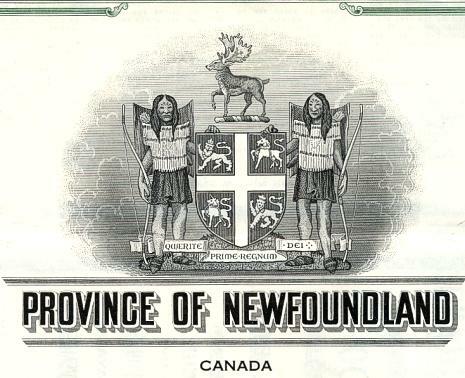 Beautifully engraved Specimen certificate from the Province of Newfoundland dated 1967. 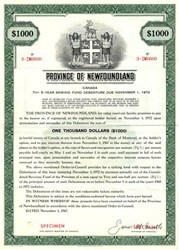 This historic document was printed by Canadian Bank Note Company and has an ornate border around it with a vignette of the Newfoundland Seal. This item has the printed signature of the Minister of Finance and is over 34 years old. This is the first time we have had this for sale and we only have one. Newfoundland (French: Terre-Neuve; Irish: Talamh an �isc; Latin: Terra Nova) is a large island off the northeast coast of North America, and the most populous part of the Canadian province of Newfoundland and Labrador. The island of Newfoundland (originally called Terra Nova) was most likely first named by the Italian John Cabot (Giovanni Caboto) in 1497, which would make it the oldest European name in North America. The province where this island is located was also called Newfoundland up until 2001, when its name was changed to Newfoundland and Labrador (the postal abbreviation was simultaneously changed from NF to NL). Newfoundland is separated from the Labrador Peninsula by the Strait of Belle Isle and from Cape Breton Island by the Cabot Strait. It blocks the mouth of the Saint Lawrence River, creating the Gulf of Saint Lawrence, the world's largest estuary. Newfoundland's nearest neighbour is the small French overseas community of Saint-Pierre and Miquelon. It is 111,390 km2 in area, making it the world's 15th largest island. The provincial capital, St. John's, is found on the southeastern tip of the island. Cape Spear, just south of the capital, is Canada's easternmost point. The island of Newfoundland has an approximate population of 485,000. Newfoundland is pronounced by Newfoundlanders as new-fin-land or new-fun-land and take exception to it being pronounced with the last syllable slurred, (as new-found-l'nd). Newfoundland has a dialect of English known as Newfoundland English, a dialect of French known as Newfoundland French and a dialect of Irish known as Newfoundland Irish.